Friends of Tuesday Shorts are now appearing monthly at the Boxcar Lounge (http://boxcarlounge.com/): Our FIRST phenomenal reading is November 28, 2007, 8:00 PM, 168 Avenue B, East Village NYC. Please join us and forward to anyone you know. We wanna see your shorts there too!Hosted by Shelly Rae Rich, writer (see http://blog.shellyraerich.com/) and co-editor of Tuesday Shorts (http://myspace.com/tuesdayshorts), the series kicks off with an eclectic group of talent. Rusty Barnes grew up in rural northern Appalachia. He received his B.A. from Mansfield University of Pennsylvania and his M.F.A. from Emerson College. His fiction, poetry and non-fiction have appeared in journals like Pindeldyboz, Post Road, and Red Rock Review. After editing fiction for the Beacon Street Review (now Redivider) and Zoetrope All-Story Extra, he co-founded Night Train, a recently reinvented literary journal, which has been featured in the Boston Globe, The New York Times, and on National Public Radio. Sunnyoutside Press published a collection of his flash fiction, Breaking it Down in November 2007. Linda DiGusta is a freelance writer and artist. Active in the NYC theatre for more than a decade as a director, designer and performer, the inventiveness of acting and collaboration on a screenplay re-kindled her early interest in fiction, and she has had several short stories published in print and online. In the fine art world, she currently has 2 still-life drawings in the exhibition "Lineal Investigations" at the Housatonic Museum of Art, and her assemblages and drawings have been seen in group exhibitions in Manhattan and Brooklyn, including at Art Gotham in Chelsea this month. Integrating art and writing, Linda also writes for and serves as Executive Editor of Resolve40.com, an online publication created by artists in 2005 to present the art world from a fresh point of view. She lives in midtown Manhattan with artist Mark Wiener and their multi-species family. More at: http://www.lindadi.com/ and http://www.resolve40.com/. Anne Elliott has performed her poetry, with and without ukulele, at the Whitney Museum (with the Beats show), PS122, Lincoln Center, The Poetry Project at St. Mark's, Woodstock '94, and other venues in and out of NYC. Her poems have appeared in Aloud: Voices from the Nuyorican Poets' Cafe, Verses that Hurt: Pleasure and Pain from the Poemfone Poets, and other anthologies. 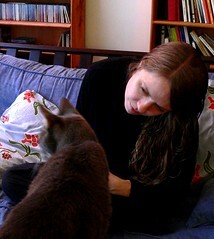 Her fiction has appeared in Hobart, Pindeldyboz, FRiGG, Ars Medica, and others, and she blogs on the writing life and feral cat management at http://assbackwords.blogspot.com/. Carol Novack, a former criminal defense lawyer and Australian government grant recipient, is the author of a chapbook of poetry, play, collaborative CD and two collaborative films. Writings may or will be found in many publications, including American Letters & Commentary, Action Yes, Del Sol Review, Diagram, 5_trope, Gargoyle, Journal of Experimental Fiction, La Petite Zine, LIT, Notre Dame Review, and the Star*Vigate anthology of best online writings. Carol publishes the multi-media e-journal Mad Hatters' Review (http://madhattersreview.com/), curates a reading series at the KGB Bar, and runs lyrical fiction writing workshops. She'll be a resident at The Vermont Studio Center next year. For additional details, see her blog (http://carolnovack.blogspot.com/). Well, folks, the same thing happened to me that happens to a lot of people in November...life. Dayjob stuff captured my attention, and kept me from thinking about my NaNoWriMo novel last week. I've crossed the 25,000 word halfway mark, but I'm way behind quota, and there's no way I'll catch up. Still, it's 25,000 words I didn't have before. And I'm still going. I'm doing about 1500 a day at the moment, but once you're behind, you're behind. So be it! It's supposed to be an exercise in unconditional self-love, so I'm gonna go easy on myself. Yell at me if you think I've got it wrong. 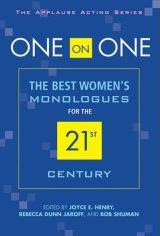 I was delighted to have my contributor's copies of ONE ON ONE: THE BEST WOMEN'S MONOLOGUES FOR THE 21ST CENTURY arrive in my mail yesterday. Don't you just love the colors? In case you're wondering, I'm right on schedule for NaNoWriMo. As of this moment, my November novel's 11,681 words. And still, no plot has emerged. But you know the Wrimo motto: No Plot? No Problem! Plus, you know how I feel about plot. I won't re-rant on it today. This novel, or whatever it is, feels more like a meditation, or rumination. More spiral in shape. The themes are coming through, or I'm digging at them. I feel like it hangs together on metaphor and theme, but not on a horizontal timeline. One thing I'm learning is I like the 1667 word a day quota. I've worked before with a 300 word a day quota, and now I'm thinking that's way not enough. The bigger quota gets me into the composition-head more deeply. It hurts my performance at work, probably, but it's only for a month, right? All my daydreaming out the window. The other thing I'm learning is the bigger quota means I absolutely can't reread more than a day's work as I get started on a new writing session. I usually do a lot of rereading and tweaking, in my "old" writing process. The Wrimos say don't reread AT ALL, and I disagree with that. Often I reread yesterday's work and find places where I can flesh out the detail. And if building wordcount is the goal, that helps more than it hurts. But reading back any more than that results in memorizing the prose, which only makes it harder to kill the darlings later. I memorize the cadence of a sentence and then it feels "weird" (for lack of a more accurate word) to cut part of it. Plus, there's no cutting in NaNoWriMo. That's rule one. I'll keep you posted. Let me know if you're doing it too! Check out Summer Pierre, she baked a blog post. She also put her blog to bed. Cute cats too!! And check out Todd Colby's poem about Panda meat. Also another about Akron liars.